If you’ve been around long enough as a landlord, it’s almost a sure bet you’ve had at least one terrible experience with a tenant. These nightmare tenants can come from all walks of life and can lead you to lose thousands of dollars in property damage, unpaid rents and legal fees. As much as you would like to be able to tell the future and avoid these types of bad tenants, once in a while your judgment will get the best of you and let you down. Well, what if we don’t have to use our gut feeling? Is there a way to really know what you might possibly be getting into? We have come up with a short list of some items some landlords regularly overlook when going through the tenant screening process, and maybe this will help you avoid the mistake of allowing the handsome young couple with a dark history rent out your beautiful two bedroom condo. Do they often arrive late, or miss work? How often do they fall behind on projects or do they skip deadlines? Do they have any discipline issues? Keep in mind many former bosses may not answer any question other than dates of employment to avoid defamation of character lawsuits. But that information alone can be useful to confirm facts presented in your tenant screening application that are helpful to determine. In a nutshell, you’re trying to determine how responsible this person is, so try sticking to those types of questions that will reveal the answer to this question. Let’s face it. When you’re thinking about renting your rental home or apartment, you want the neatest, cleanest, most responsible people renting your property. Some landlords have come up with a genius way of figure out whether a potential tenant is dirty or clean. How? Surprise visits. What you want to do is drive around the neighborhood at a time you know they will be home, usually after 6pm after everyone’s home from work or school. Call them and ask them if they wouldn’t mind you swinging by so that you could personally explain some key points in your lease, which you will have plenty of blank ones in a folder in your car. Next, you want to try as hard you can to get them to invite you so you could take a quick look around and see the condition in which their current home is in. If you manage to accomplish this before even accepting their application, you can quickly eliminate the duds and avoid wasting your and the potential tenants’ time. Most landlord do a quick credit report check and make their decision by quickly glancing at their FICO score, but what you really want to do is to dig in deep into what type of debt and payment history your potential tenant has. What you want to do when you review someone’s credit report is to look for constructive debt. These types of debts are the ones that add some sort of value to this person’s life, for example a car when living in a part of town that pretty much requires you to have a car. Avoid possible tenants with a lot of credit card debt. This type of debt is usually racked up by consumer purchases and getting into tight financial spots. Do you really want someone living in your condo that frequently gets into financial pinches? One of the quickest ways to pawn off a bad tenant to an unsuspecting new landlord is to just give him or her a good recommendation and bid them good riddance. I know, this seems awful, but it happens. What about the previous landlord after that though? Chances are they will give you an honest opinion since they no longer have a relationship with said tenant. When you screen prospective rental tenants, keep an eye out for the “landlord friend.” Those are just friends of the possible tenant who pose as landlords and speak wonders of them. Ask tenant screening questions that you know only a landlord would know, like asking for the full address to keep on file, etc. This will quickly eliminate any shady work the possible tenant is trying to do. Asking your prospect tenant you are screening for more than one previous address and landlord contact information is not unheard of and is a trend that’s on the rise. Most ask for at least 2 to even apply, or three for best results. Some tenants like to implement a lie intolerant policy. One lie, even a white little one will automatically disqualify the tenant from their application process. If you notice a little bit of smoke smell on their clothes or breathe when you ask them if they smoke, you can assume they are lying and rip up their application right on the spot. What works a lot of time is to let them know beforehand this way everyone is aware of the policy and there are no surprises when you catch them in a lie. Everyone makes a mistake. Tenants are no exception. Evictions are not a mistake. 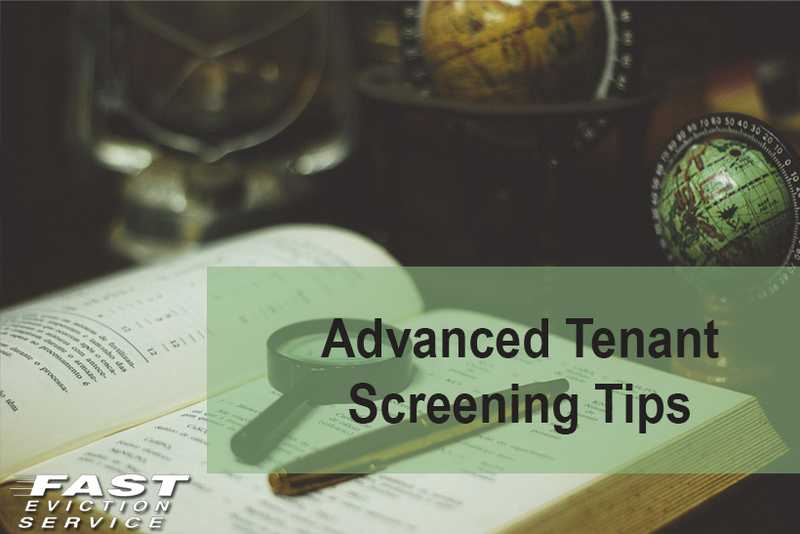 If the tenant you are screening has a record of evictions, it means they willfully fought to stay in a property they were not entitled to remain in. A good recommendation is to just say no as soon as an eviction comes up on their record. I think this goes without having to explain it, but just a friendly reminder. Remember, this is your pride and joy, your bread and butter we’re talking about here. If you as the owner/landlord are not willing to go the extra mile to protect your valuable investment, then who will stand in its line of defense? Taking a couple of extra steps and time screening rental tenants with these techniques and it can potentially save you thousands of dollars and a lot of your valuable time and hair.